Commute times for people of color in the Twin Cities are, on average, much longer than for white commuters. 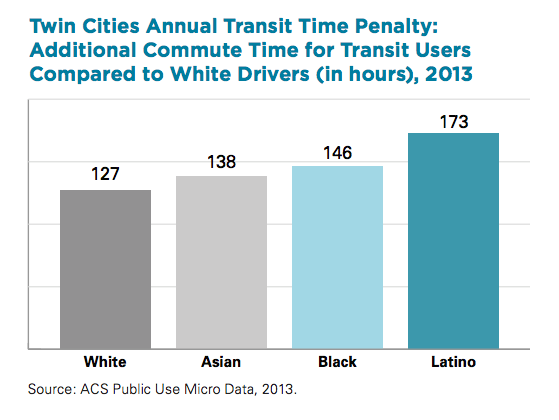 Researchers studied the transit time penalty for different ethnic groups in the Twin Cities, in other words how much time they lost in transit compared to making the same commutes in private vehicles. For African-Americans and Asian-Americans, it added up to three and a half weeks per year. For Latinos the time penalty was 4.5 weeks. “… if you’re an African-American, you’re losing the equivalent of a month’s worth of your life commuting on a bus versus if you were able to take a car. If you’re a Latino it’s close to five weeks,” Anthony Newby of Neighborhoods Organizing for Change explained. The transportation funding plan proposed in the House Republican transportation omnibus bill relies on shifting about $1 billion of revenues from the general fund over the next four years to fund road and bridge construction. In the meantime, the House plan would result in a 25 percent cut in transit service — resulting in longer waits, more delays, longer travel times, lost service, and more crowded buses and trains. Decreased service will lead riders to look for more reliable means of transportation; with fewer riders, fare revenues will decline. This vicious cycle will result in longer waits and travel times, more delays, and fewer useful routes. These draconian cuts could endanger federal funding for future projects important to the Twin Cities region and result in legal violations under Title VI of the Civil Rights Act. Minneapolis and St. Paul are not alone in their transit-funding woes. In New York City, which already boasts the nation’s longest commute times, the trip to work is much worse for low-wage workers.